One of my all time favourite actresses, Jean Harlow, sews on set. This week has been a real test of my positive thinking exercises. It’s been hard- I’ve been potty training D (which means barely leaving the house) and a family member is very, very ill. So being indoors with lots of time on my hands has meant that I’ve had to fight my inner negativity. So I’ve done what I usually: make stuff. I’m a bit of a crafting jack of all trades, master of none. I mainly knit and bake, but I’m teaching myself to sew on a machine and to dabble in cross stitch, embroidery and crochet. For me, I don’t really count writing as part of this process, as I find (for me) that the creativity I use for writing is slightly different, but YMMV. I first started crafting properly ten years ago and never really looked back. Making stuff with my hands feels good. Yes, it’s more expensive than going to Primark and buying something, but there’s a real connection with what I’m making. If I’m feeling sad, or angry, or stressed, or frustrated, all those feelings become wrapped up in the fabric of what I’m doing. There’s also the feeling of letting my mind focus on something else; if I’m focusing on a pattern or trying to perfect a recipe (at the moment, I’m slightly obsessing over producing a decent home version of a Millie’s cookie), I can leave whatever is upsetting me to one side. It definitely feels like I’m using a different part of my brain. Finally, there’s the finished product. If it’s successful, I can be proud and feel like my time has been spent productively- or at least, more productively than if I’d just spent my time watching TV and worrying. If it’s gone wrong, I then have something I can explore- why did it go wrong? What can I do differently? Again, it’s all about helping my mind think about something else and not letting myself be consumed by the darker bits of my brain. Anyway, I’m going to go and work on my Hitofude cardigan. Are you making anything at the moment? Or do you want to learn a craft? I am my own worst critic and I always have been. But I also use that nagging little voice as an excuse- the reason I haven’t written anything on my long-neglected novel for ages; the reason I haven’t properly taught myself to sew, despite the fact I’ve expressed, time and time again (and often on this blog) the desire to learn to do so. It’s exhausting being so negative. Last week, I went to the Savage Beauty exhibition at the V&A. Looking at McQueen’s beautiful designs, being in touching distance of some incredibly beautiful clothing and realising that McQueen had to start somewhere made me realise- I can do something if I put my mind to it. Sure, it’ll never be couture, but I can have a go. One of the worst things, I think, is a fear of failure and making mistakes. So I’m embracing new things with a positive outlook. What’s the worst thing that can happen? No one will die if I write a duff sentence or produce a wonky hem and no one needs know if I made a mistake. I’ll just move on and learn from it. 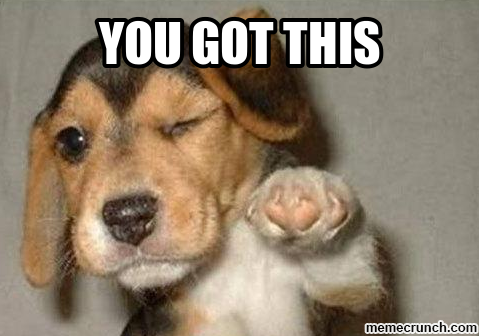 So the tl;dr to take away from this: challenge yourself this weekend. Have a good opinion of what you could achieve (don’t start from a negative place! ), but don’t go to pieces if it’s not perfect. Keep me posted- what did you do to quiet your nagging self doubt? 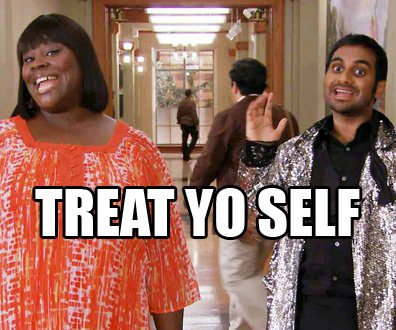 The Happiness Project #4: Treat yo’ self! 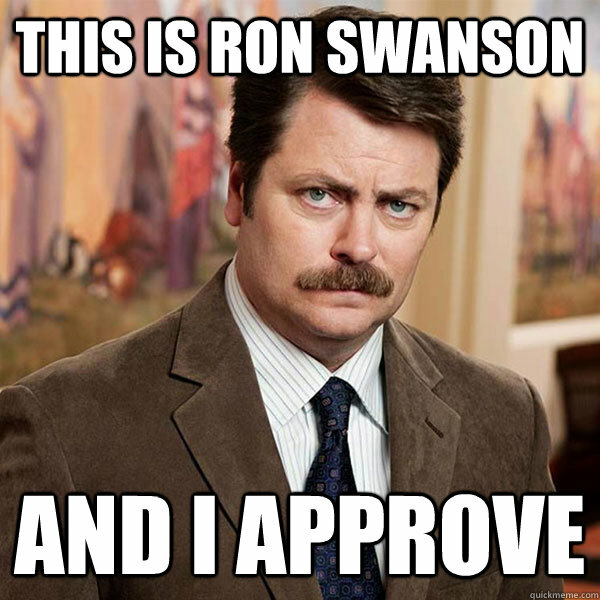 Of all the gifts that Parks and Recreation gave to the world-including and not limited to Ron Swanson- I think Donna and Tom’s annual Treat Yo’ Self day is possibly the best one. 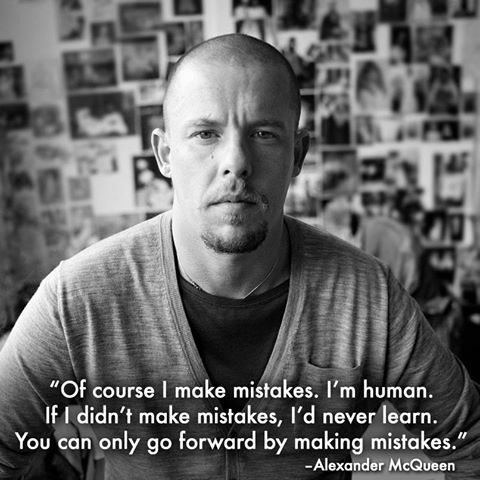 Today, I’m off to London to see the McQueen exhibition and I’m planning on picking up some tea from Fornum and Mason. Oh! And I’m doing it all child-free. I planned the whole shebang during a really tough time at work and paid for it in bits- one month I bought the exhibition ticket; the next I bought the train tickets. It gave me something to look forward to, especially in hard moments and now I can’t quite believe it’s today! But treating yourself doesn’t have to be expensive… sometimes, after a day of D being hard work, or lots of meetings about data (ALWAYS fun), a hot bath with loads of bubbles and a good book can be enough. So today- I want you to TREAT YOURSELF. Let me know how!